In last session we have seen how to create Application Load Balancer using "elbv2" command. Classic Load Balancer is used to route traffic, based on applications or network level details. It is best option for simple load balancing traffic across multiple EC2 instances where high availability, auto scaling and robust security are basic requirement of application. It works under 4th layer of OSI model which is Transport Layer and supports TCP, SSL, HTTP, HTTPS protocols. 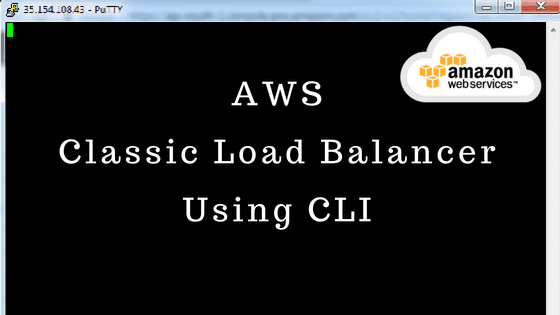 Classic Load Balancer supports command "aws elb" without v2 version operation where as in last session for Application Load Balancer we used command "aws elbv2". Note: In Classic Load Balancer, We are specifying listeners while creating classic load balancer and in case of Application Load Balancer first we created listener separately then register that with load balancer. We configured FrontEnd protocol (Protocol=HTTP,LoadBalancerPort=80) that means client request will convert to load balancer via HTTP protocol on port 80. Also we configured BackEnd protocol (InstanceProtocol=HTTP,InstancePort=80) that means connection between ELB and instances via HTTP protocol on port 80. This DNS address which AWS has been assigned to our new classic load balancer. You can verify it from aws management console by clicking on "Load Balancer" menu. To create new load balancer listener we need to specify name of existing load balancer and specify listener configuration for FrontEnd and BackEnd protocols. >> aws elb create-load-balancer-listeners --load-balancer-name pgLoadBalClassic --listener "Protocol=HTTP,LoadBalancerPort=80,InstanceProtocol=HTTP,InstancePort=80"
lets verify it from aws management console by clicking on "Load Balancer" menu.